I read this article and found it very interesting, thought it might be something for you. The article is called Soundbite: Kevin Powell & Brian O’Keefe: Loose Canon and is located at https://www.totallydublin.ie/food-drink/food-drink-features/soundbite-kevin-powell-brian-okeefe-loose-canon/. 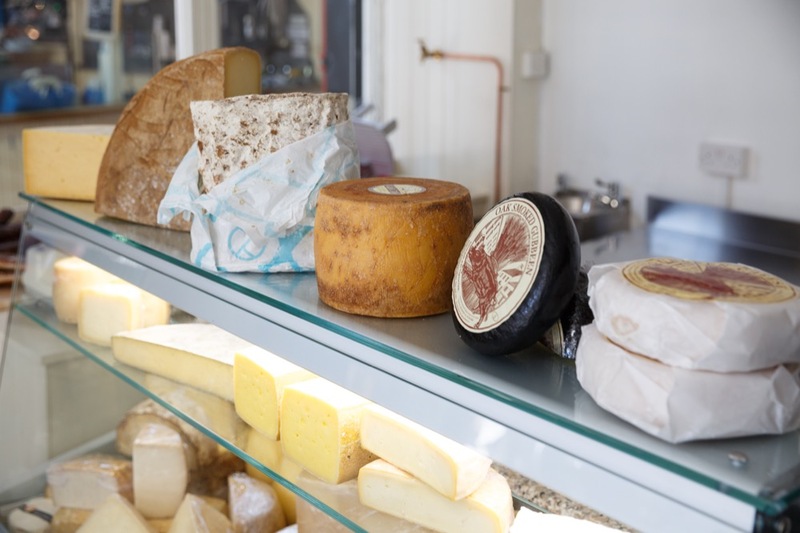 Beady-eyed foodies will have noticed the recent arrival of Loose Canon, an enticing new artisan cheese and natural wine spot which opened its doors on the corner of Drury Street and George’s Street Arcade last month. The brainchild of Gruel Gorilla’s Kevin Powell and Brian O’Keefe of Meet Me In The Morning, we talked to Kevin about the new venture’s strong focus on Irish producers and what’s next for the dynamic duo. People know you from your work with Gruel Gorilla and Meet Me In The Morning. Tell us your story and how Loose Canon came about. 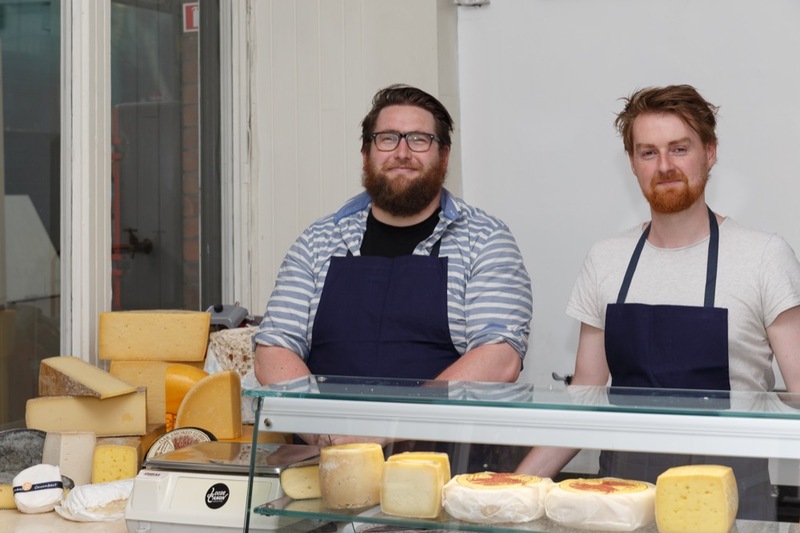 Many moons ago, when I was making cheese and such stuff, I used to host a pop-up supper in my house called News of the Curd, as a way of promoting the work of the producers in Temple Bar Food market. I then set up Gruel Gorilla to help increase footfall into local businesses by doing various one-off events. It had the same ethos and focus on Irish producers and our tagline was, ‘Food anywhere and food everywhere,’ basically because I think that people should have access to Irish produce anywhere in this country, and also because I’m a bit of a messy cook! Then around Christmas the year before last, Brian asked me to come on board to help him run Meet Me In The Morning, and we’ve been doing that ever since. We won best café in the Irish Restaurant Awards for Dublin that year and then we opened Reference Coffee next door. When Brian was in Dingle on holiday recently he went into the little cheese shop down there. He thought it was amazing and when he came back he said, “You know I always wanted to open up a cheese shop?” We stumbled upon a Daft advert for the old Appassionata Flowers unit in George’s Street Arcade, pitched our idea to the landlords and they loved it. We took about eight weeks to build it out and open up. It’s a very casual, focused place, different to what’s around, and so far the reaction has been really positive. Tell us more about the kinds of produce we can expect to find at Loose Canon. We wanted to open a place where people could experience natural wine, Irish charcuterie and amazing cheeses; all the things we know and love. I contacted producers I had worked with in the past, mainly people that had never supplied to Ireland, hassled them to come on board and then chose all my favourite things! For the most part, it’s 95% Irish cheeses, lovely stuff like Derg Cheddar from Nenagh, soft Corleggy made in Belturbet by Silke Croppe and Cáis Dubh from Frank and Gudrun Shinnick in Fermoy. We’ve also got Bermondsey, a super cool Alpine cheese made in central London. Each day between 12 and 4pm we put on six or seven different cheese toasties paired with some nice wines. In the evenings we have glasses of wine and small plates of food, things like Corleggy goats’ cheese on toast with pickled cherries, fermented gooseberries, fresh tomatoes from the McNallys and Thai basil. Irish charcuterie is much harder to find than Irish cheese, but there are people producing beautiful free-range pork products here. 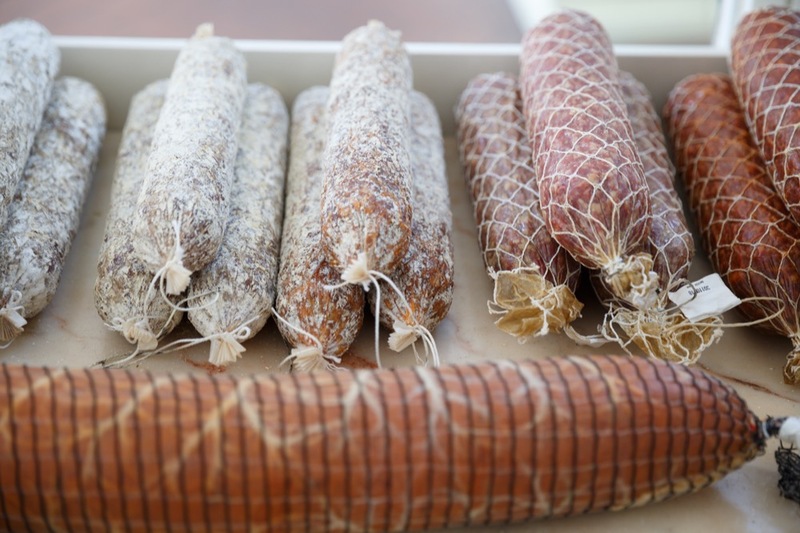 We have lovely produce from people like Eoin from the Wooded Pig, loma and braesola from Alistair Corndale, and amazing salamis from Charlie Cole at Broughgammon. So far, people are really loving it! You’re big proponents of natural wines. Yeah. Brian got into some really strange and amazing natural wines when he was living in Paris. When he came back he couldn’t get them here at all, so he reached out to some suppliers for personal use, initially. When we got our wine licence for Meet Me In The Morning, we agreed we’d only have natural wines there. We love that they’re minimal intervention, handpicked and then fermented using the natural yeasts that occur on the grapes. Because they’re unfiltered, vegans tend to be happy, so all round, like the cheeses that we do, it’s a more natural process. You can only get them in small allocations, small parcels really, that someone has crafted and worked very hard to make. 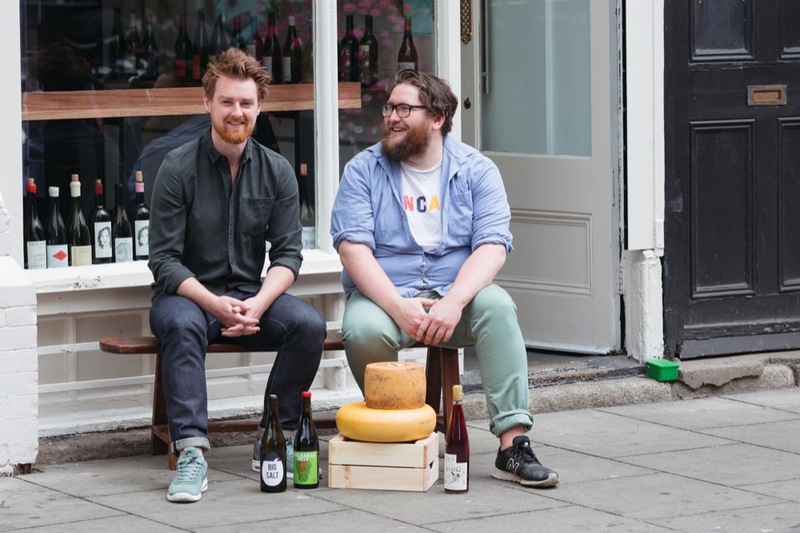 Currently we have two suppliers, Shane Murphy of Fion and Paschal of Le Caveau in Kilkenny, who’s been a big proponent of natural wine for years. He’s super excited to see a place finally open here. How did you come up with the name “Loose Canon”? In France if you’re going for a drink with your pals you might say you were having ‘un canon’, so when Brian and I were talking one day he said he thought ‘Loose Canon’ was a cool name. The more we thought about it the more came from it, for instance, ‘canon’ in books is a stringent rule on how things happen, and this is a loose version of that. We’re doing what we want, and we want people to enjoy it. Our next tote bag is going to be all about what the word ‘canon’ means! At the end of the summer we’re going to close Meet Me In The Morning for about a week, and then reopen as a restaurant called MMIM. We’re putting a new bar in, changing the tables and giving it a lick of paint but it’ll still be as relaxed as ever, just slightly refocused. We’ll have morning and lunch service seven days a week and five nights a week there’ll be dinner service. We always thought that if we ever opened up another little coffee spot somewhere, Reference would be the name – so watch this space! Loose Canon is open 7 days and 6 nights a week 10.30am -10pm, Sun 12-10pm, Tuesday closed from 5.30pm.